I'm always on the lookout for great recipes that use the forgotten bananas. I'm a huge fan of this recipe. Preheat oven to 350 degrees. Use nonstick cooking spray to coat muffin pan well. In a large bowl or mixer cream the butter and brown sugar together. Beat in the eggs, vanilla and bananas until well combined. Add all the remaining ingredients, except the chocolate chips, to the banana mixture. Mix well. Divide the batter evenly into each muffin tin. 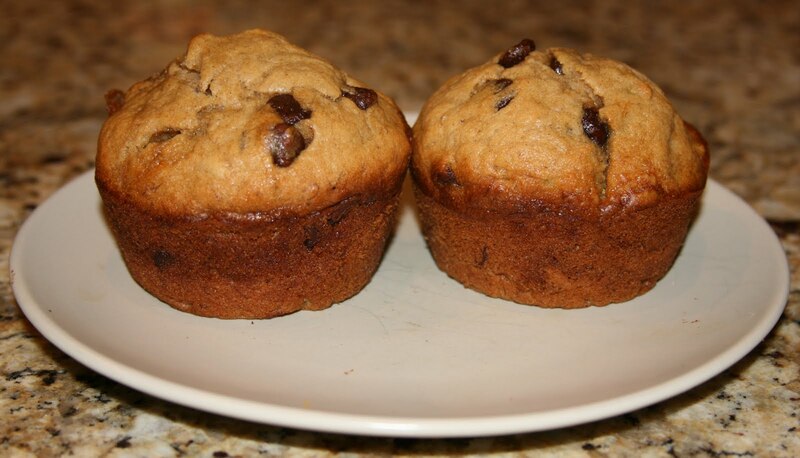 If you have extra chocolate chips place some on top of the batter. Bake 18-22 minutes. (I used large muffin pans and mine took the full 22 minutes) You know they are done when a toothpick inserted in the center comes out clean. Have a recipe you'd like to share? Send it in for our Readers Show Off. Don't have pictures of it? Send the recipe, I'll try it out, take pics and post! 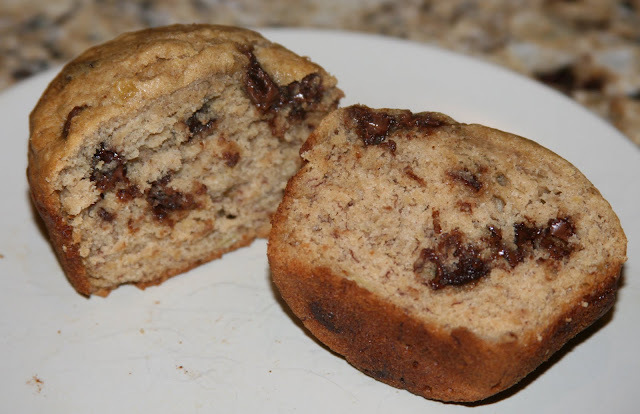 Did you know you can stick too ripe bananas in the freezer? Then you can use them in one of these recipes later, or you can stick frozen bananas in smoothies. You were right, these look amazing!! I am definitely going to try this recipe. yum I'll have to try these! I sometimes get the banana chocolate chip coffee cake at starbucks as a guilty pleasure...bananas and chocolate where made for each other! Yum! This could be an awesome way to sneak banana's to Miss a. I've love if you'd come link up this recipe, and others if you'd like, to my recipe linky/contest!